Phase 1 of the consultation program has now closed. It ran from April – July 2018 and involved many opportunities for people to have their say and give their ideas and feedback. Below are some of the activities that were undertaken. To help guide this project we assembled a People’s Panel—a deliberative process where community representatives considered the feedback gathered from the community and provided advice and recommendations to the re:imagine project team. To learn more and see what the People’s Panel did, visit the People’s Panel page. 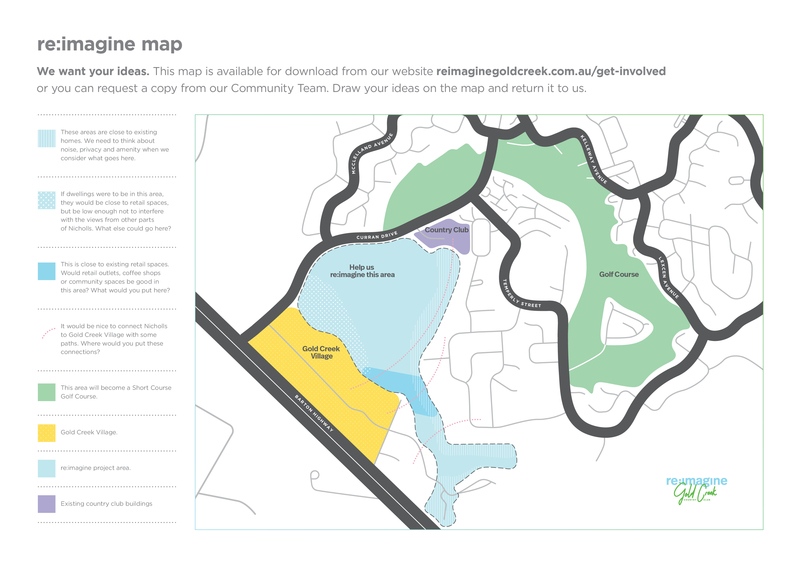 The re:imagine Map showed the area that will no longer be used for a golf course and contained space for people to share your thoughts and ideas. We wanted to know what you care about. What are the special parts of life that make the Nicholls/Gold Creek area great and what’s missing? Our survey closed on Friday 4th May 2018. The survey results are part of the feedback provided to the Gold Creek Country Club owners. We delivered communitote bags to golf course neighbours. The communitote bag contained information on the project, as well as different ways for people to share their thoughts, including a copy of our re:imagine Map. During Phase 1, we held a family movie night on the golf course, hosted a business forum and visited the Federation Square Markets. Stay informed on what’s going on and when. Sign up to our mailing list. We will be keeping people informed on the next stages of the project through our regular updates throughout the project. Sign up below to ensure you stay up-to-date.